Think of a number from 1 to 63. Then, on your piece of paper, circle the cards that contain your number. For example, if your number is 15, you’ll need to circle the card in the upper-left because 15 is on that card. You’d have to circle all the cards that contain 15. At this point, the audience member will say something like “Top left, top middle, and bottom right.” Then I will add the smallest numbers on each card (in this case, 1, 2, and 32) and answer in five seconds or less, “Your number was 35 (or whatever the sum is).” It turns out that the number is always the sum of the smallest number on the given cards. To explain this trick to my audience, I’ll present the following conceptually similar trick using 20 cards. I’ll ask the audience to pick a number between 0 and 99 and then find the cards that contain that number. The first card tells me that the number is in the 70s; the last card tells me that the ones digit is 2. So the answer must be 72. 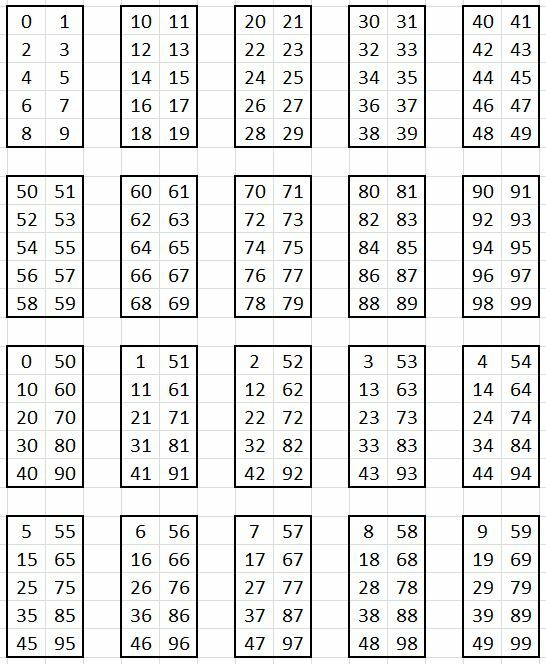 Stated another way, I can add the smallest number on each card (70 + 2) to get the answer. This magic trick looks utterly unimpressive because the trick is so obvious because base-10 arithmetic has been so utterly drilled into our heads since elementary school. So my audience is usually surprised to learn that the first magic trick, with the six cards with numbers from 1 to 63, is conceptually the same as this 0-99 trick. I’ll explain this in the next post.